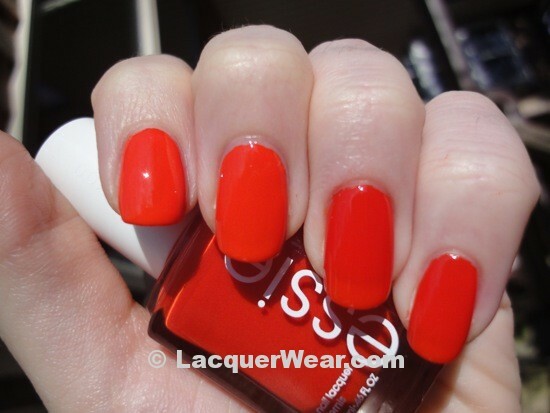 Essie Spring 2012 – Orange, It’s Obvious! Here’s another polish from Essie’s Spring 2012 Collection – Orange, It’s Obvious! is a really bright medium orange. The exclamation mark is part of the polish name, and I can’t off the top of my head think of another Essie polish that has an exclamation mark in its name. It seems kind of OPI-like. But I guess this polish kind of deserves it, because it is truly orange. It falls right in the middle and isn’t too red or too yellow. The formula on this polish is good, and it only took two coats to even out and be opaque. It goes on slightly thick, but that does mean that it has good coverage. It was hard to capture how bright this polish is – it has a slight neon hint, and is just very emphatically orange. I like it a lot – this spring is apparently the time to wear the brightest polish you can turn up. I compared it to Essie’s Meet Me At Sunset, a bright orange from the Summer 2011 collection. It was interesting to compare these, because they weren’t as close as I thought they would be. Orange, It’s Obvious! is on my index and middle fingers and Meet Me At Sunset is on my ring and pinky fingers below. Meet Me At Sunset leans redder and looks a little darker. But the formula is the biggest difference between the two – Orange, It’s Obvious is creamy and fully opaque at two coats, but Meet Me At Sunset has a bit of a jelly finish and has a more translucent look, even at three coats. You can even see some visible nail line on the Meet Me At Sunset nails below, even though I added an extra coat of polish to them. I think that I prefer Orange, It’s Obvious for that reason, and the fact that it’s just slightly more orange. I also tried out Essie’s Kisses and Bises over Orange, It’s Obvious!. This turned out really pretty! I used two coats of Kisses and Bises for the picture below, and it made Orange, It’s Obvious! into a pearly, lighter color with a hot orange flash inside the fuchsia shimmer. Essie’s Spring 2012 Collection is out now in stores – I found mine at Walgreens. I LOVE this orange! It’s so vibrant! Thanks for showing, just added it to my wishlist!